My travel memoir eBook, Traveling Together: Cliff and Me and the Motorcycle Makes Three, is FREE TODAY, Sunday October 14, 2012! I hope you will take advantage of this one-day promotion to download the book for your Kindle or other electronic device. Just click on this link to the book at Amazon. Please feel free to share this information with others today. My ebook, Cliff and Me and the Motorcycle Makes Three will be available FREE through Amazon on Sunday October 14, 2012. I hope you will consider taking a “look inside” to read the first several pages at the link to the book’s Amazon page (book title above). Please take advantage of this one-day free promotion to download the book for your Kindle or other electronic device. It’s not necessary to have a Kindle to read it. With a free app from Amazon it is available for reading on computers, iPads, iPhones and other devices. Here is a link to get that app. If you choose to read the book, I sincerely thank you for your interest in my story. An honest review would be welcome and appreciated. I will return to telling the story of our Australian journey. 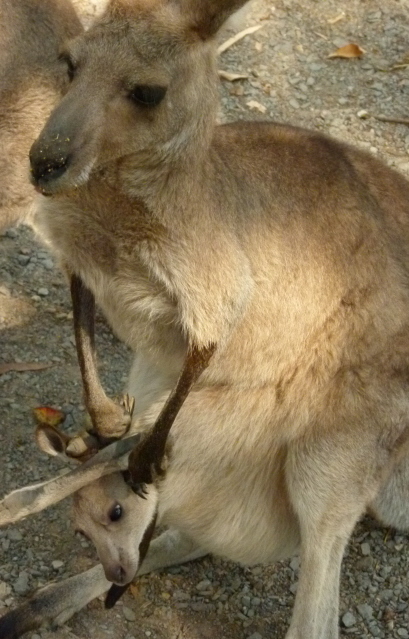 Here is a cute picture we took of a Mama Kangaroo and Joey at the Cairns Zoo to tide you over. One year ago today I woke up early and ventured out into the town of Port Douglas. We had flown from the outback to the northeastern coast of Australia the evening before. As I drank my cappuccino in this sidewalk café I reflected on my inner journey, reading “The Artist’s Way” by Julia Cameron and writing in my journal. 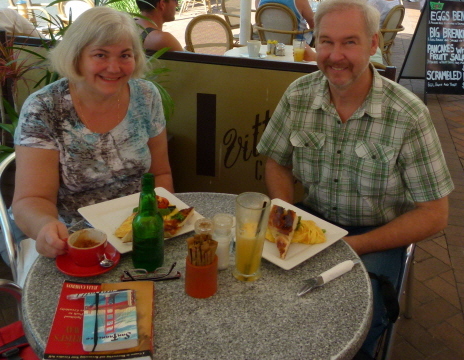 Luckily Cliff was able to find me so we could eat breakfast and explore the town. Every mindful journey cultivates new perspectives. The obvious one is how we look at the world around us – taking in the sights, sounds, foods, and so on – gaining a physical and cultural awareness of a place we have not seen or a situation we have not been in before. This is the world we photograph and show to our family and friends when we get back home. At the same time, there is a journey within. Getting away from everyday obligations creates a kind of relaxation and true being of self that is sometimes hard to access during days at home with its inherent responsibilities. When we travel, we can free our mind to pay attention to the voice within and reflect on our life. 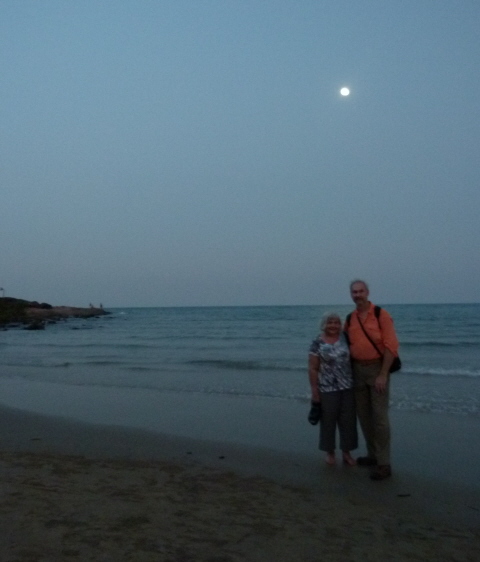 At dusk that evening we had the lovely Four Mile Beach at Port Douglas nearly to ourselves under a moonlit sky. This is the kind of dreamy scenario that inspires couples who travel together to connect their inner journeys together. Perhaps this is our best opportunity to discover what we are satisfied with in our life and what we want to change. The phrase “Australian Saga” reminds me of Colleen McCullough’s 1977 book and the subsequent 1983 mini-series The Thorn Birds which spoke to the young romantic in me. (Anybody else with me here?) Perhaps more than anything else I can point to, this dramatic fictional story brought the Australian Outback to my attention and contributed to my dream to visit the country someday. Last year, along with my husband Cliff, I realized that dream. Uluru at sunrise – a mesmerizing sight. The saga I am recounting here, about our travels, includes a visit to the Red Centre of Australia. However my husband and I had a completely different experience in the Outback than what I read about in The Thorn Birds. We never drove a jeep on long, dusty red roads or visited a sheep ranch. Instead we chose to visit a national park that is endowed in amazing natural beauty and cultural significance. Living in the moment and experiencing the beautiful intensity of the desert at Kata Tjuta. certain parameters – some areas of the park are restricted for religious and cultural purposes – but I never felt limited. 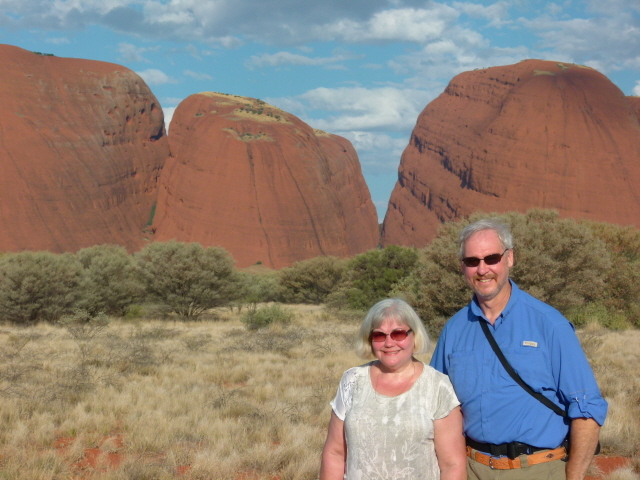 In the few days Cliff and I were in the Red Centre, we lived the kind of travel experiences I could only dream of. We took part in the Sounds of Silence dinner – a pricey but very cool experience where we were seated at candlelit tables under the desert skies with people from around the world, eating the food and hearing the didgeridoo music of the outback, under the night sky of the southern hemisphere. 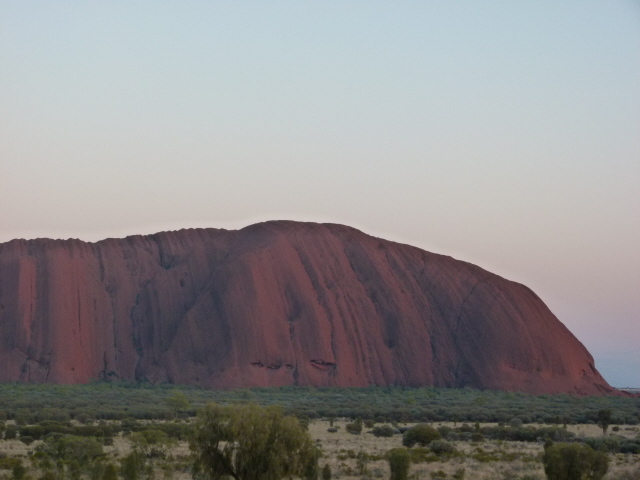 We visited Uluru at sunrise, midday and sunset. The rock is fascinating on so many levels. Its color changed from rosy sandstone to a ruddy brown to a deep burgundy depending on daylight and perspective. Up close you can see the texture and crevices on the surface that looks smooth from a distance. We hiked though the rocks at Kata Tjuta on a hot day. We were fortunate to be there during a fertile spring bloom that followed earlier rainfalls. The contrast of vivid red dirt and lush green foliage with flowering plants in the desert painted an enduring image in my memory. This part of our Australian journey was an intense experience that will live forever in my heart. I believe in creating wonderful travel experiences – putting yourself in a fortuitous situation and then allowing the magic to happen. That means making the effort of learning about your destination and planning the trip accordingly. That is why I was out of my comfort zone when my husband suggested that we go to Australia and make our internal trip arrangements with a local agent once we were there. Since it was difficult to put together our transportation connections and other detailed plans from the USA, I agreed. We left for Australia with only the airline reservations that got us to Sydney and back home, and hotel reservations for the first two nights in Sydney. That’s it. Lots of people would thrive on that level of spontaneity – Cliff loved the idea, but I admit to being a little uneasy. One year ago today we walked into X BaseTravel in Sydney to make travel arrangements for our trip. We had a pretty good idea of what we wanted to do (I did do my advance reading and research after all!) but we needed somebody to help us put it together. Thank goodness we found Jay. He put together a detailed itinerary for the rest of our trip, which included flights, trains, buses, day tours, accommodations and all our connections. We put ourselves in Jay’s hands, and were rewarded with easy and relaxing travel to awesome destinations. Thanks, Jay! 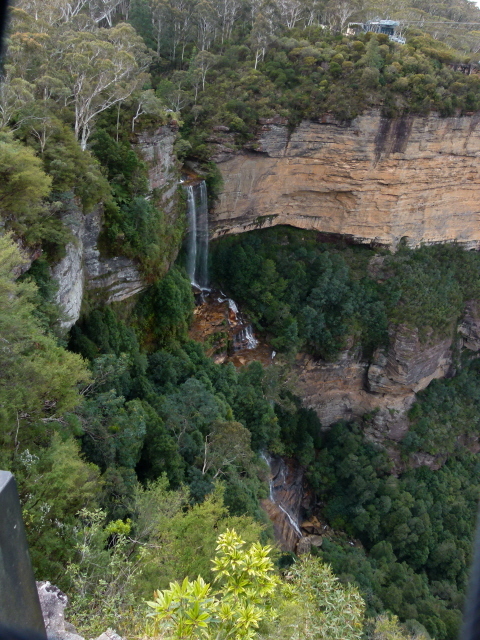 Overlooking Katoomba Falls at Blue Mountains National Park. The Blue Mountains National Park of Australia is remarkable on many levels. Paths lead to breathtaking vistas overlooking waterfalls and a rain forest. In the distance are sandstone formations like The Three Sisters, and a eucalyptus forest that emits a fine hazy mist that gives the Blue Mountains their name. Wild cockatoos fly overhead. The park protects sites of significance to Aboriginal culture. No wonder this place is part of a World Heritage area. 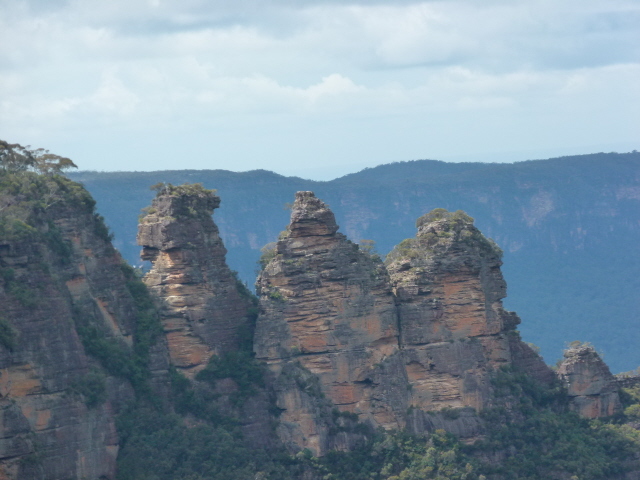 The Three Sisters and the blue haze of the eucalyptus forest beyond. learned that tour operators in Australia do this type of excursion very well. We could just relax with other visitors in a small bus and leave the driving and all the details to our genial host. One of our destinations in the park was Scenic World, with its skyway ride over fern trees in the rainforest valley below. We also took a ride in an open air “train” (like a caged-in roller coaster) that plummets into a hole in the ground – the world’s steepest railway plunge – in what used to be a coal mine. Of course, Cliff and I, along with our new friend from the tour, Tamara, climbed into the front seat of the train so we could be the first to take the dive! Our instructions were to take the boardwalk path to a skyway ride that would lead us back to the bus in Scenic World’s parking lot. Somehow, the word “boardwalk” dropped out of my memory and I led Cliff and Tamara astray, hiking along a steep, rocky path. I thought the occasional signs that said “Landslide” referred to the trail’s name – until we came to an actual landslide area! By the time we realized our error and turned back, our bus had left without us. Luckily, there were other tours there. A guide was able to track down our driver and arrange a rendezvous in a nearby town. I bought a package of fine chocolates to share with our guide and tour mates – hoping the treat would help put me back in good standing after causing a delay! Lucky for me, it all ended well, and we even saw our first kangaroos in a golf course on our way back to Sydney. 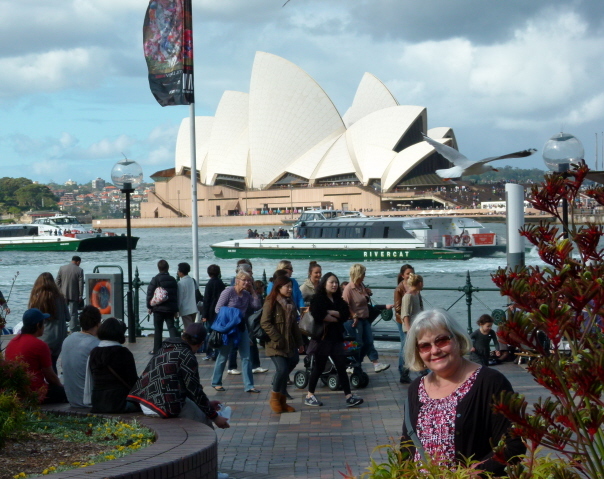 Here I am in front of the busy Circular Quay area of Sydney Harbour on my first day in Australia. We arrived in Sydney one year ago today. It was a warm, lush, humid spring day – a contrast to the fall weather we left behind in the USA. I am not able to sleep on airlines, so it is an understatement to say I was tired. We settled into our hotel room and rested for a while before venturing out to see the city on foot. 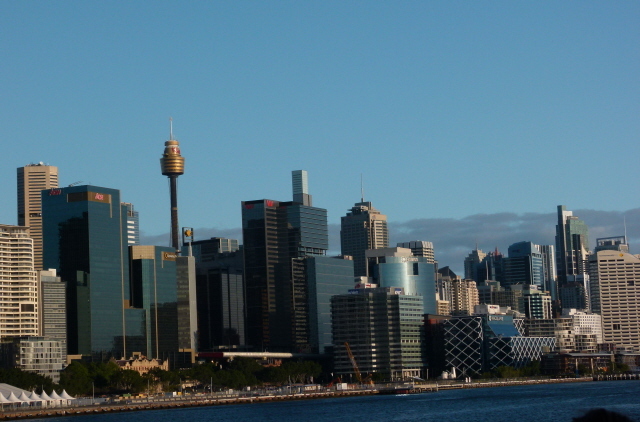 Sydney immediately became part of my short list of favorite urban areas. It has fascinating architecture – a juxtaposition of modern and historic – public art, blooming gardens, and peeks of sprawling Sydney Harbour, an inlet of the Pacific Ocean, beyond the buildings. We walked to the busy waterfront to see our first glimpse of the Sydney Opera House. Back in our hotel we booked a tour of the nearby Blue Mountains National Park for the next day. Check back here tomorrow for more.